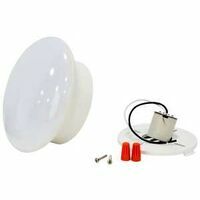 Feit Electric Retrofit Light Kit, Dimmable, LED Lamp, 9.3 W Lamp, Suitable For Use With: 4 in Recessed Cans, 3.45 in Overall Height, 3.8 in Overall Depth, Includes: Standard Base E26 Adapter and a Pre-Mounted Trim, Energy Star Approved, RoHS Compliant, UL Listed, 120 V Input Line Voltage, For Wet Locations and Recessed Lighting Performance LED recessed lighting retrofit kit. Comes with a standard base adapter and a pre-mounted trim. Instant on to full brightness. Indoor, suitable for damp locations. For use with air tight, IC or non-IC fixtures. UL/CUL Listed. LED Air-Tite retrofit, with Integrated Light Engine and Baffle Trim. Over 600 lumens. 50,000 hours. 3000K, Compatible with 4" standard recessed housings: HALO, ALL-PRO and more. High brightness, diffusing, optical quality lens. Dimmable to 5 percent with select dimmers. Easy installation with universal mounting clips. Wet and damp location listed and IC (Insulated Ceiling) rated. cULus Listed, Energy Star. Performance LED recessed lighting retrofit kit. Comes with a standard base adapter and a pre-mounted trim. Instant on to full brightness. Indoor, suitable for damp locations. For use with air tight, IC or non-IC fixtures. UL/CUL Listed. Performance LED recessed lighting retrofit kit. Comes with a standard base adapter and a pre-mounted trim. Instant on to full brightness. Indoor, suitable for damp locations. For use with air tight, IC or non-IC fixtures. UL/CUL Listed. Performance LED recessed lighting retrofit kit. Comes with a standard base adapter and a pre-mounted trim. Instant on to full brightness. Indoor, suitable for damp locations. For use with air tight, IC or non-IC fixtures. UL/CUL Listed. Performance LED recessed lighting retrofit kit. Comes with a standard base adapter and a pre-mounted trim. Instant on to full brightness. Indoor, suitable for damp locations. For use with air tight, IC or non-IC fixtures. UL/CUL Listed. LED retrofit kit can be wired or screwed into an E26 existing socket. Dimmable, 2700K, 10 watt, 625 lumens, 90CRI. Rated lifetime of fixture is 50,000 hours, no bulb to replace. IC Rated and Certified Title 24 (T24). UL/cUL-Damp Locations. UV, IR and Mercury-free. E26 with quick disconnect socket. Energy Star. Used in indoor recessed can, high hat in residential, office, retail, restaurant, school, hospital and hotel/motel locations. 40,000 hours average rated life. UV, IR and mercury-free. White. UL/cUL Listed for damp locations. Used in indoor recessed can, high hat in residential, office, retail, restaurant, school, hospital and hotel/motel locations. 40,000 hours average rated life. UV, IR and mercury-free. White. UL/cUL Listed for damp locations. LED Air-Tite retrofit, with Integrated Light Engine and Baffle Trim. Over 600 lumens. 50,000 hours. 3000K, Compatible with 4" standard recessed housings: HALO, ALL-PRO and more. High brightness, diffusing, optical quality lens. Dimmable to 5 percent with select dimmers. Easy installation with universal mounting clips. Wet and damp location listed and IC (Insulated Ceiling) rated. cULus Listed, Energy Star. 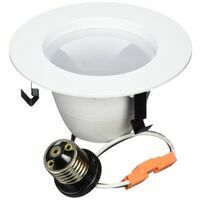 Medium base E26 retrofit ceiling light for installation into existing porcelain socket. Replacement for incandescent. Not dimmable. 120 volt. 50000 hours average life. Screws into most existing plastic and porcelain lamp holders without any wiring required. Also installs in junction boxes for new construction applications. Suitable for damp and dry locations. Medium base socket adaptor included. Integrated white trim. 11000 average life hours, 120 volt. Medium base socket adaptor included. Integrated white trim. 11000 average life hours, 120 volt. LED downlight comes with color preference feature that allows manual selection between 3 light colors -2700K(soft white), 3000K(warm white), 4000K(bright white). Replacement for recessed can upgrade to LED technology. Comes with both 2 torsion springs and 2 pressure clamps for use with types of recessed cans. 120 volt, 90 CRI. 50,000 hours rated life. Instant start down to -4 degrees F. Energy Star and cUL certified. LED downlight comes with color preference feature that allows manual selection between 3 light colors -2700K(soft white), 3000K(warm white), 4000K(bright white). Replacement for recessed can upgrade to LED technology. Comes with both 2 torsion springs and 2 pressure clamps for use with types of recessed cans. 120 volt, 90 CRI. 50,000 hours rated life. Instant start down to -4 degrees F. Energy Star and cUL certified. LED retrofit kit can be wired or screwed into an E26 existing socket. Triac dimmable, 3000K, 18W, 1300 lumens, 120V. CRI 90. Rated lifetime of fixture is 50,000 hours, no bulb to replace. Certified Title 24 (T24). IC Rated for direct contact with insulation. UL/cUL- Damp Locations. UV, IR and Mercury-free. Energy Star. Ultra LED recessed and surface mount downlight kit. 50,000 hour average life. Medium base socket adaptor included. Integrated white trim. Wet rated for indoor/outdoor applications. E26 base, 82 CRI, 13 watt, 120 volt. Replaces up to 120 watt incandescent. LED downlight kit. For new construction and retrofit applications, recessed and surface mount applications, in most standard four-inch, five-inch and six-inch insulated ceiling (IC) housings, airtight (AT) housings and non-IC housings. It can also be surface mounted to a standard 4-inch J-Box or specially designed connector box. Dimmable to 20 percent with standard 120V electronic low voltage dimmers (recommended), incandescent or magnetic low voltage dimmers. 120 degree beam angle with low glare. Complies with cULus wet location, ceiling only (shower rated), and damp location listed ceiling and wall. Energy Star. RoHS compliant, cETLus Listed. Used for recessed lighting. Energy efficient LED retrofit kit, compatible with most 5 in. and 6 in. recessed cans. They are easy to install, dimmable and last up to 50,000 hours. Each kit comes with a standard base adapter and a pre-mounted trim. Soft white and dimmable via the HomeBrite app. 110 degree beam spread, 880 lumens, 50,000 life hours, 3000K. 7.4"H x 3.3"D. 75 watt equivalent using 14 watts. Controlled using a smart device, no extra hardware needed. 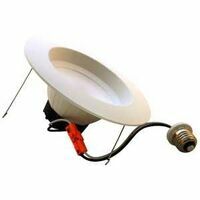 Medium base E26 retrofit ceiling light for installation into existing porcelain socket. Replacement for incandescent. Not dimmable. 120 volt. 50000 hours average life. Screws into most existing plastic and porcelain lamp holders without any wiring required. Also installs in junction boxes for new construction applications. Suitable for damp and dry locations. Medium base E26 retrofit ceiling light for installation into existing porcelain socket. Replacement for incandescent. Not dimmable. 120 volt. 50000 hours average life. Screws into most existing plastic and porcelain lamp holders without any wiring required. Also installs in junction boxes for new construction applications. Suitable for damp and dry locations. Compatible with most recessed housings. Flexible mounting. Over 600 lumens; 50,000 hours. 3000K. 35 degrees tilt up to 360 degrees rotation. Dimmable to 5 percent with select dimmers. Adjustable Gimbal for accent, task, grazing and downlighting. Easy installation with mounting clips. Damp location listed and IC (insulated ceiling) rated. Medium base socket adaptor included. Integrated white trim. 11000 average life hours, 120 volt. Medium base socket adaptor included. Integrated white trim. 11000 average life hours, 120 volt. Medium base socket adaptor included. Integrated white trim. 11000 average life hours, 120 volt. Medium base socket adaptor included. Integrated white trim and white reflector. Up to 30 degree tilt Gimbal feature. E26 base. 50,000 hours average life. LED recessed downlight kit. Suitable for 5" and 6" recessed cans. Medium base socket adaptor included. Integrated white trim. 50,000 average life hours. Indoor and outdoor dry, damp and wet locations. LED recessed downlight kit. Suitable for 5" and 6" recessed cans. Medium base socket adaptor included. Integrated white trim. 50,000 average life hours. Indoor and outdoor dry, damp and wet locations. LED recessed downlight kit. Suitable for 5" and 6" recessed cans. Medium base socket adaptor included. Integrated white trim. 50,000 average life hours. Indoor and outdoor dry, damp and wet locations. Compatible with most recessed housings. Flexible mounting. Over 600 lumens; 50,000 hours. 3000K. 35 degrees tilt up to 360 degrees rotation. Dimmable to 5 percent with select dimmers. Adjustable Gimbal for accent, task, grazing and downlighting. Easy installation with mounting clips. Damp location listed and IC (insulated ceiling) rated.